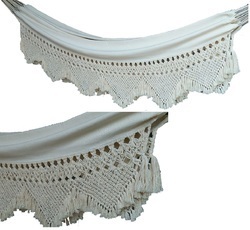 Prominent & Leading Manufacturer from Pondicherry, we offer fabric hammock, hammock with crochet border, fabric hammock with crochet border, farbic hammock with fringes, fabric hammock with fringes-large size and fabric hammock with color fringes. 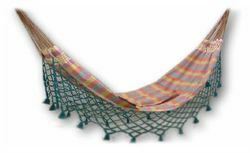 We are recognized in the industry for offering an extensive range of Hand Weave Fabric Hammock. 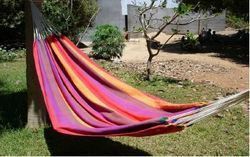 The offered hammock consists of a woven network of twine or thin rope stretched with ropes between two firm anchor points such as trees or posts. 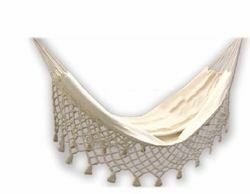 Further, provided hammock is thoroughly tested on various parameters by our expert before offering to our clients for assuring its flawlessness. 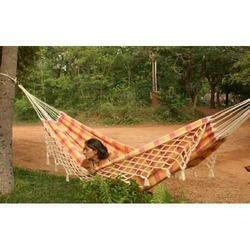 Moreover, this hammock is made available to the clients in varied designs, sizes and other specifications. 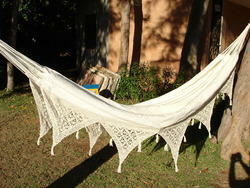 It is made by 100% cotton Handwoven Fabric. 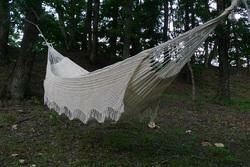 Looking for Fabric Hammocks ?